Ashe, having spent ten days in the Curragh Camp, was transferred to Mountjoy prison to face courtmartial. 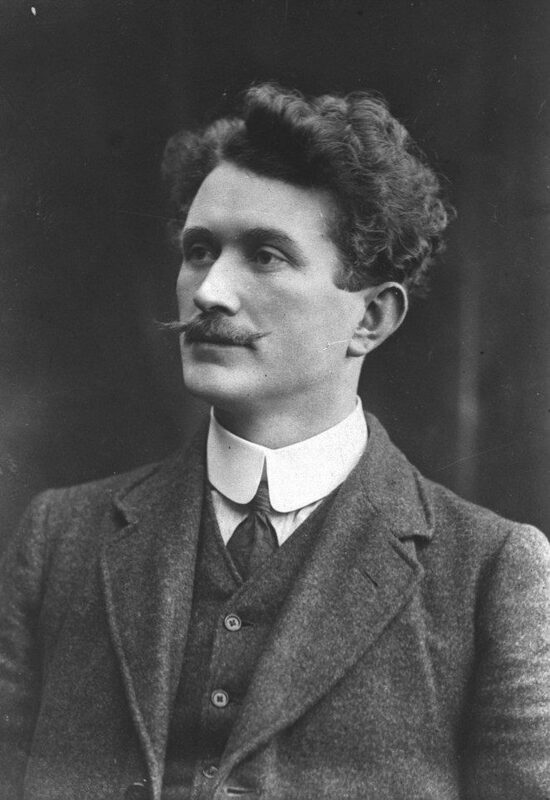 There were quite a number of his colleagues already imprisoned in Mountjoy, among them Fionán Lynch and Austin Stack. The courtmartial took place on Monday, September 3Rd, the charge being “causing disaffection among the civilian population.” The general belief was that the authorities’ determination to place Ashe behind bars was due more to his presidency of the I.R.B. than to his speeches he made. The sentence of the courtmartial was two years hard labour with one remitted. The status given to the Irish Republican prisoners in Mountjoy was that of the ordinary criminal. They objected to this and demanded the rights of political prisoners. When their demands were refused Ashe and his colleagues refused to do the prison work. The prison authorities punished them by taking away their beds and bedclothes and all their possessions including their shoes. They were left with nothing but the clothes they were wearing. Further protest by the prisoners demanding political status having failed, they went on hunger strike on Thursday, September 20Th, 1917. Two days later the Lord Mayor of Dublin, Alderman Laurence O’Neill visited the prison to try and resolve the serious situation which had developed. He failed, but his visit brought about the return of bed, bedclothes and shoes to the prisoners, not before considerable damage had been done to Ashe’s health. Forcible feeding began on Sunday, September 23Rd. Food consisting of a pint of milk and two eggs was pumped into the stomach through a tube which was inserted through the mouth. Ashe was forcibly fed five times in all. On Tuesday morning, September 25Th he was forcibly fed about 11:15 a.m. Immediately afterwards he collapsed. He was taken to the prison hospital where his condition began to deteriorate. He had great difficulty in breathing caused by food getting into his lungs and also as a result of sleeping on the floor of a cold damp cell without any protection. He was transferred to the Mater Hospital, Dublin at 5:15 that evening. Despite the best efforts of the medical staff in the Mater his condition continued to deteriorate, his lungs showing signs of bronchitis and congestion. Later that evening Fathers Albert and Augustine of the Capuchin Order visited Ashe. When they realised that he was dying they stayed only a short time. As they were leaving they gave him their blessing and Fr. Augustine spoke to him in Irish. “God is good and He has a good Mother.” “Yes indeed, Father” said Ashe. These were the last words he was known to speak. He died at 10:30 p.m. on Tuesday, September 25Th, 1917. The cause of death according to the post mortem examination was heart failure and congestion of the lungs.